Protesters walk along the construction line of a new, bollard-style barrier that broke ground near New Mexico’s Santa Teresa Port of Entry along the US-Mexico border in April. June 2018. Louse Davilla, 42, receives a cleansing ritual treatment from her mother, Esther, in her home in Burlington, Washington. The farming community is home to several generations of Mexican immigrants, but Esther's practice of traditional Mexican healing, or Curanderismo, is disappearing in the US. See the full story at NPR's partner station, KUOW. September 2013. An Aztec performance group from El Paso, Texas performs a few paces from New Mexico’s Santa Teresa Port of Entry during a demonstration against new border wall construction. June 2018. American and Jordanian soldiers gather near Jordan's Wadi Rum desert for the Eager Lion, an annual series of US-led training drills for Middle Eastern militaries. May 2015. A young skateboarder rides across Jordan's first skate park, 7Hills, days after its inception in downtown Amman. See the full story on Al Jazeera. February 2014. Independent wildlife biologist Rosemary Schiano surveys an area of southern Arizona’s Organ Pipe Cactus National Monument, along the US-Mexico border. June 2017. Syrian refugees haul weeds from a farm plot a few paces from Jordan's northern city of Mafraq. Since 2011, some 1.4 million Syrians have fled to Jordan,many of whom are now working in the country's farms, where laws against refugee labor have been harder to enforce. June 2015. Syrian refugee children watch a TV program inside an empty room of their new home in Irbid, some 50 miles north of Jordan's capital Amman. March 2015. Marble Canyon Lodge manager Barry Adams searches for his office keys in the charred rubble of Arizona's Marble Canyon Lodge. Built in 1926, The lodge is located near the Grand Canyon's North Rim and is a historic pit stop for Grand Canyon and Colorado River tourism. The fire was a result of a gas leak in the lodge's kitchen around 1 a.m. and was unable to be quickly responded to due to the landmark's remote location on the Arizona Strip. June 2013. Two merchants rest after Tel Aviv's Shuk Carmel market closes for the day. July 2013. Jordanian pilot Muath Kasasbeh's wife and father load into their vehicle following a visit with King Abdullah II to discuss Jordan's attempted negotiations for the pilot's release from ISIS militants on January 28, 2015, just days before the release of a grisly video depicting the pilot's execution. January 2015. A Jordanian boy holds a toy and dons a traditional Jordanian keffiyeh during a demonstration of solidarity in the capital Amman with Kasasbeh, days the video of his death was released. February 2015. 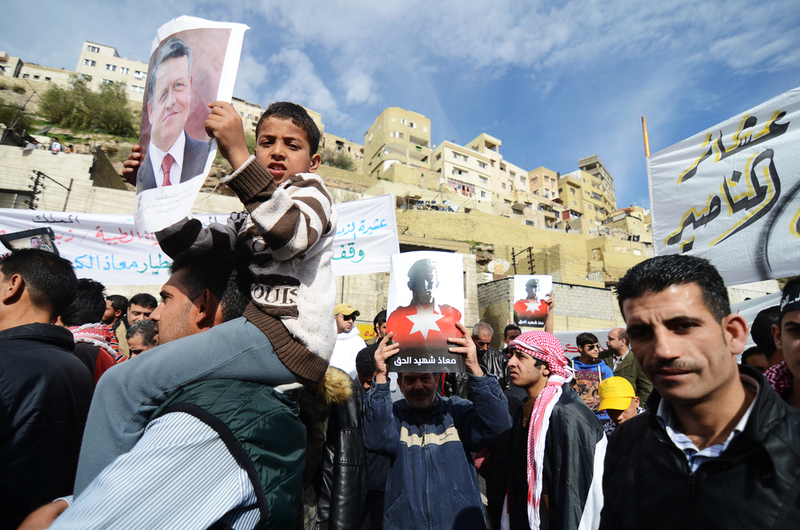 A Jordanian child holds a poster of Jordan's King Abdullah II during Amman's solidarity demonstration, one of the largest the country's seen in years. February 2015. Skateboarders and onlookers gather during one of 7Hills Skatepark's first operational days, in downtown Amman. February 2014. A drag queen zips up her boots before the annual University of Washington Drag Competition in Seattle, Washington. April 2013. Brenda prepares for her performance in the backstage bathroom before the annual UW Drag Competition. April 2013. Pacific Northwest Ballet Soloist Sarah Ricard Orza and principal dancer Batkhurel Bold perform as part of George Balanchine’s “Apollo.” Along with PNB’s “Carmina Burana,” Balanchine’s renowned piece has been performed by PNB since 1993. April 2012.